My niece Jennifer is giving away a free photo session for one lucky reader (must be located in NC). Jen designed my header and took the head shot for my blog. Cherish what you value the most: your memories. With jlyDesigns you can do it for free. I would like to invite you to participate in a contest where you can win a free photography session. Share this giveaway on your facebook wall. 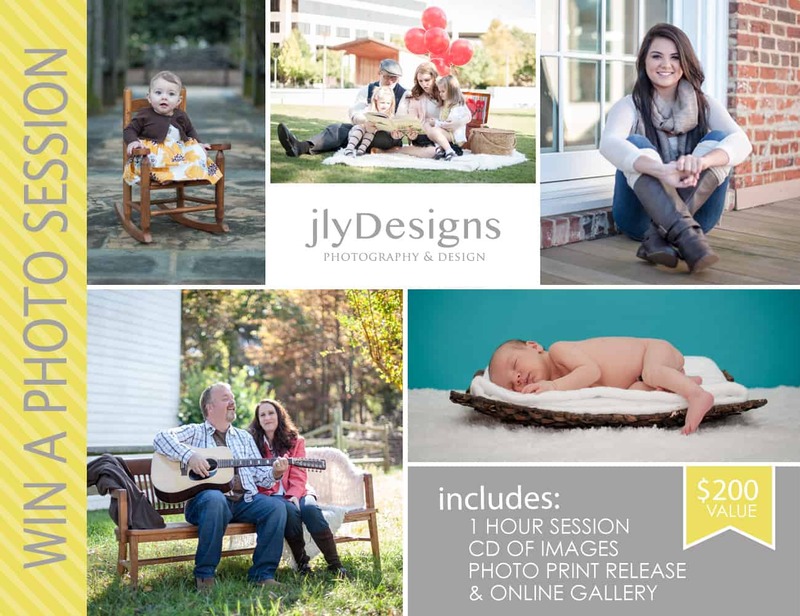 Join the fun with jlyDesigns and win a free session. The giveaway ends on Dec. 31 and the winner will be announced on Jan 1, 2013. *Winner must be located in North Carolina. I have been following little Cooper’s pics since before the little man was born and love the pictures! I have a 9 and 1/2 month old little one of my own, that I would love to get family pics made with!! Her photos look beautiful! We liked her page and shared the contest! I have had a photo shoot with Jennifer before and the photos she takes are amazing. She is so nice to work too. She gives you ideas on poses and shots and works great with kids. Would love to win the photography session! I just liked the FB page for JLY Designs and also shared your giveaway on my FB page! Thanks for the chance to win! Merry Christmas to you and all of your loved ones, Marty! Oh the joy of having a photo session with my son would be fantastic. thanks for the chance. I have seen lots of Jenn’s wonderful photography and would love the opportunity to receive a free maternity session…that is once I begin to show a lil more…haha! Ashley, I had no idea. Congratulations!! We have watched jen become an amazing photographer. She has a passion for this work. We love her photography. She is creative, patient, and wants to ensure that her clients are happy. I continue to recommend her work to friends and family. The trips to olan mills, portrait innovations, etc. are no longer an option. Have really enjoyed seeing Jen’s pictures of Sofia Rizzo … what great advertisements for your work! I’ve shared the contest on my Facebook wall, liked JLY Designs and commented here! I’d love to win a photo session with Jen!! Love the pictures of the Rizzo family. Sophia looks like she had a wonderful time. LOVE JLYDesigns!! Jennifer has a wonderful gift and I love looking at her work! I sure hope I win…the pictures are super cute! Great giveaway – you are liked and shared!!! My girls had such a great time with Jen. They really opened up with her and we got the best pics they have ever taken. They are already begging me to do it again. A free session would be great! I had a great time with Jen, can’t wait to do it again. I hope I win!